An elevation seven stadia north of Jerusalem, where, according to tradition, the high priest and the inhabitants of the city welcomed Alexander the Great (Josephus, "Ant." xi. 8, § 5). Josephus states that the place was called Σαφείν (Aramaic, ; Hebrew, ), which name was translated into Greek as Σκοπός = "prospect," since from this height one might see Jerusalem and the Temple. It is evident from this statement that Σκοπός was not originally a proper name, and that it became one only by degrees. 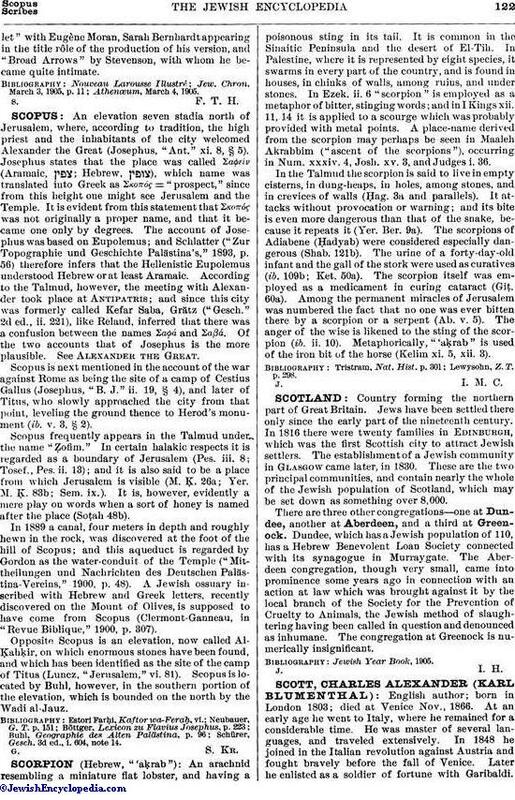 The account of Josephus was based on Eupolemus; and Schlatter ("Zur Topographie und Geschichte Palästina's," 1893, p. 56) therefore infers that the Hellenistic Eupolemus understood Hebrew or at least Aramaic. According to the Talmud, however, the meeting with Alexander took place at Antipatris; and since this city was formerly called Kefar Saba, Grätz ("Gesch." 2d ed., ii. 221), like Reland, inferred that there was a confusion between the names Σαφά and Σαβά. Of the two accounts that of Josephus is the more plausible. See Alexander the Great. Scopus is next mentioned in the account of the war against Rome as being the site of a camp of Cestius Gallus (Josephus, "B. J." ii. 19, § 4), and later of Titus, who slowly approached the city from that point, leveling the ground thence to Herod's monument (ib. v. 3, § 2). Scopus frequently appears in the Talmud under the name "Ẓofim." In certain halakic respects it is regarded as a boundary of Jerusalem (Pes. iii. 8; Tosef., Pes. ii. 13); and it is also said to be a place from which Jerusalem is visible (M. Ḳ. 26a; Yer. M. Ḳ. 83b; Sem. ix.). It is, however, evidently a mere play on words when a sort of honey is named after the place (Soṭah 48b). In 1889 a canal, four meters in depth and roughly hewn in the rock, was discovered at the foot of the hill of Scopus; and this aqueduct is regarded by Gordon as the water-conduit of the Temple ("Mittheilungen und Nachrichten des Deutschen Palästina-Vereins," 1900, p. 48). A Jewish ossuary inscribed with Hebrew and Greek letters, recently discovered on the Mount of Olives, is supposed to have come from Scopus (Clermont-Ganneau, in "Revue Biblique," 1900, p. 307). Opposite Scopus is an elevation, now called Al-Ḳahḳir, on which enormous stones have been found, and which has been identified as the site of the camp of Titus (Luncz, "Jerusalem," vi. 81). Scopus is located by Buhl, however, in the southern portion of the elevation, which is bounded on the north by the Wadi al-Jauz. Schürer, Gesch. 3d ed., i. 604, note 14.